The recent clash between Iran and Israel is the latest indication that there's some unfinished business to attend to in Syria even with the decline of the civil war and the territorial defeat of ISIS. In the skirmish over the weekend Iranian troops launched an Iranian-made attack drone against Israel from inside Syria, which resulted in what Brig. Gen. Tomer Bar, the deputy head of the Israeli Air Force (IAF) called, "the biggest and most significant attack the air force has conducted against Syrian air defenses since Operation Peace for the Galilee" in 1982 during the First Lebanon War. Unfortunately, it also resulted in the first loss of an Israeli fixed-wing combat aircraft since the same 1982 war in Lebanon. It means the war in Syria is shifting gears and entering a new phase, where the rules of the game are also being put to the test. This event marks the first time Iranian soldiers used their own weapons to fire at Israel; usually they employ any number of proxies or Hezbollah. Nevertheless, it was not the first time they or those who serve the regime in Tehran have used unmanned aerial vehicles (UAVs). In fact, Iran's drone program, which includes suicide drones, is rather advanced. They have developed and distributed them to Hezbollah and the Houthis in Yemen. In 2012, Hezbollah threatened to use them to take out Israel's nuclear infrastructure and by 2015, Hezbollah boasted of an advanced drone operating base in Lebanon. Nor has Iran and its loyal forces focused solely on Israel with their developing drone technology. In 2017, they used them against U.S.-backed forces in Syria after releasing footage from a day earlier where they shadowed allied forces. This specific drone from the attack in Israel was a copy of the advanced American UAV that Iran seized in 2011 and it emulated Western technology including its "low signature" profile which helps evade detection. Just last week, Iran opened a line to mass-produce offensive drones that are meant to carry precision munitions. There is no indication yet as to whether the drone involved in the weekend's attack was carrying ammunition. In this new phase of the Syrian conflict, the regional and international powers involved are seeking to establish new rules of the game for engagement. It includes testing the shade of each other's red lines to see if they are actually pink. Recent examples include the U.S. coalition's coordinated response to the shelling that fell near an allied base outside of Deir ez-Zor in eastern Syria. That strike came after the U.S. warned Russia and observed the hostile force build up over the course of several days. Another example is Turkey's foray into Afrin in northwest Syria that not only aroused the ire of Assad and Iran but has also rankled the U.S.-backed coalition. The Turkish president has promised a blink-first contest over the town of Manbij where U.S.-supported forces are located, after delivering an invective-laced speech against the United States before his ruling party. For Israel, this brings about yet another shift in the rules. Since the start of the Syrian war in 2011, it has had a relatively free hand to strike what it describes as "game-changing" weapons in Syria, as long as it left Lebanon alone. That in itself was a dramatic reversal of the unwritten rules, which for decades saw the Syrian border as Israel's quietest, with its enemies loyal to Iran preferring to strike from Lebanon and risk repercussions there. The 2011 rules changed in 2015 with Russia's entry into the conflict and the air defense umbrella it set up north of Homs. The T-4 air base, from which this latest drone attack was launched is located along the same parallel and is one of Syria's largest and most important airfields also used by the Russian Air Force for regional operations. 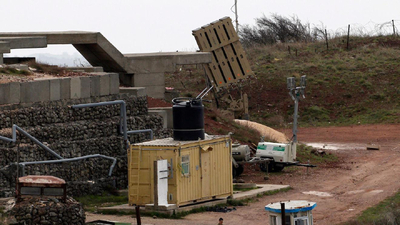 Some in Israel's security establishment have surmised that this latest drone flight was designed to lure Israel into the Syrian hornet's nest of air defenses. Whether or not this latest Iranian attack was meant as a test or to deliver a message to Israel, the U.S. and their allies, one of its goals was to make Israel think twice before responding to Iran's breaching of Israel's red lines, which aside from the transfer of "game-changing" weapons systems includes the consolidation Iran's territorial gains and the transformation of its military posture in order to further threaten Israel. All of this is aside from Iran's nuclear project, which is the loudest clock ticking in Israeli minds. I happen to be in Israel conducting a research project into the transformation of Iran's military presence in Syria as Israel's security cabinet mulls further action against Iran. In my short time here and in attending several meetings with former top military intelligence and strategic planners, a few things have become clear: Iran and Assad feel emboldened with ISIS out of commission and the civil war winding down. This was a bold opportunity to test Israel and Israel's response left little room for doubt over whether it would shy away from acting when it perceived it was in its interest. At the same time, Iran risked very little with this weekend's maneuver as it operated on Syrian territory, which is where Israel responded. That is the same dynamic that has prevailed for decades in Lebanon where Iran uses Hezbollah to attack Israel and remains well outside of Israel's crosshairs. Russia, which has provided air support for its Iranian partners in Syria since 2015 and continues to provide cover for Bashar al-Assad's use of chemical weapons against civilians, released a statement after the events that called on all sides to avoid escalation and added its own warning against any attacks on its own forces in Syria. Yet Iran's move came after multiple meetings between Netanyahu and Putin. Russia also didn't lift a finger to stop the attack near U.S. forces in eastern Syria despite the U.S. warning. As long as its forces aren't targeted, this weekend's type of skirmish works to Putin's benefit by keeping Iran in check while providing a new opportunity to sell its clients new weapons. It only becomes a problem for Moscow if its own military bases are threatened or if Israel's military response is so extensive that it threatens Iran's presence in Syria, wipes out Hezbollah, or kills Assad – all of which would require a Russian response to protect its reputation as an ally worth having. Nevertheless, while Russia and Iran are allies and partners with many overlapping goals, they also have some competing visions of Syria's future. Those areas include Assad's ultimate fate and how that is determined, and the Syrian territory needed to enhance one's strategic position. The Syrian dictator is a card Russia holds in negotiations and it will expect compensation for relinquishing it. For Iran, Assad is a nonnegotiable equity with which it will not part. Israel's intelligence in Syria is also impressive. Once they decided to respond militarily, there was no shortage of targets on their list and they have their own assumptions on what level of targets constitute a certain degree of escalation. All that's needed is a pretext. Israel saw the drone take off via satellite but waited until it reached their airspace because targeting a drone is different than targeting a shipment of new missiles being transferred to Hezbollah from Iran and striking a drone over Jordanian airspace would create an unwanted headache. But for every test or escalation Iran or Assad may have planned, Israel already has a buffet of responses at the ready. The question then is, does Iran feel lucky? Above all else, one thing is clear: Israel will not sit back and watch Iran expand its threat as it further entrenches itself in southern Syria. That means that it will likely raise the stakes for the regime in Tehran along with its puppet in Damascus. It would be helpful if the U.S. were to adopt a similar position in actions—not just rhetoric—because when it comes to Iran, the U.S. and Israel share the same goals. A more forward-leaning American role would provide some balance to the Russia-dominated chess game in Syria.